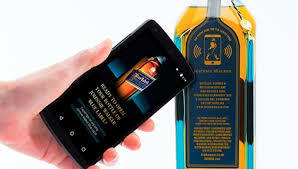 Ready for smart liquor bottles talking to smart phones? OK, so maybe it’s message ON a bottle. But the point is the same. Bluetooth technology is changing the way drinkers — and barkeeps — are interacting with their bottles. This new use of tech means consumers can customize messages on the bottles they are drinking. Heck, they even can track its exact location. Distributors and bar owners can use the same technology to track purchases and get sales data. And global drinks company Diageo even is working on smart sensor-equipped bottles that communicate with consumers’ devices and switch gears — recipes vs. sales promos — once the bottle is opened.